The late 1960s to early ’70s was a great period for grand touring coupes. Many of my favorite cars come from this era. They include exotics like the Fiat 130 Coupe and Iso Grifo. Those were just the high end ones. Even on the lower end of the price scale there were compelling coupes that offered style and in some cases economy thanks to small efficient four cylinder engines. Among those affordable options, there were plenty of Alfas, BMWs and various Fords. While these coupes came mostly from Europe, America produced its fare share of interesting GT cars also like the ’65 Buick Rivera and ’68 Corvair Monza. Volkswagen was mostly known for small cars like the Beatle. It had dabbled in sporty cars like the Karman Ghia, but mechanically it was modest with more style than performance. Creating more stylish cars was not on the mind of Volkswagen when it acquired Audi. Neither company was not known especially for sporty cars despite Audi’s linkage with Auto Union and it’s famed racing cars of the ’30s..
WV had just purchased Auto Union from Mercedes in the late ’60s, mostly to get its hands on the factory at Ingolstat. The plan was to boost production of the popular Beatle there. At the time, a sporty GT car was not a priority which made the project already underway by the newly acquired Audi go underground. Once the car was ready as a prototype, the defiant Audi designer Dr. Ludwig Kraus showed it to his VW bosses. To his amazement, they accepted his concept and put the 100 Coupe S into production shortly after it made its debut at the Frankfort Motor Show in 1969. It was a bold departure from the normal rear engine air cooled cars from Volkswagen. The 100 Coupe S was built from a shortened Audi 100 sedan frame and an enlarged 1.9 liter engine with twin carburators. VW provided a three speed automatic, but many cars were equipped with a four speed manual. Rear wheel drive with front disc brakes made the 100 Coupe a respectable handling car as a grand tourer, but it’s appearance was more likely to be compared to cars costing thousands more like the Aston Martin DBS. 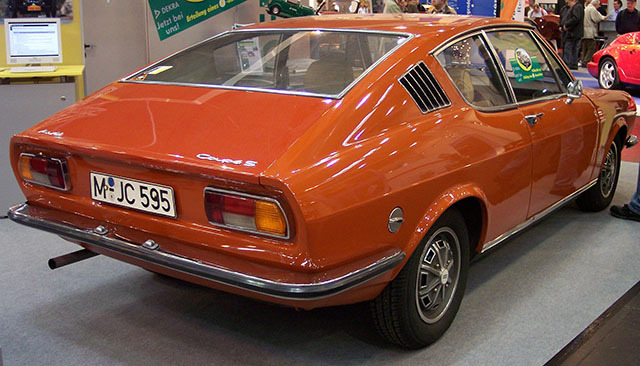 The Coupe 100 S was set apart from other Audi by its sleek fastback design. many compared it to Aston martin, but there’s a bit of Nissan 240 Z in its rear quarter view. After all the original Z car was designed by a fellow German. Speaking of Aston Martin, the year before the arrival of the 100 Coupe S, the DBS set off a trend with BMW also making its version of a DBS inspired coupe, the 2002 GT4. The 2002 GT4 and 100 Coupe S actually look more more alike with BMW’s kidney grille distinguishing the two from a distance. Of course it takes more than vented C pillars and a long nose to look like a DBS. Both the BMW and VW lacked the ultimate gracefulness of the longer Aston Martin design, but offered some of its style for thousands less and was far more practical. 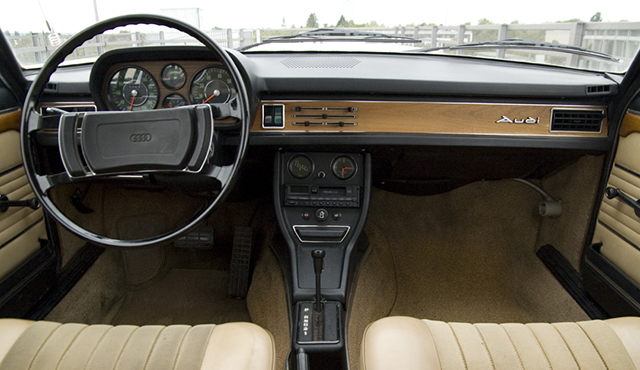 The Audi’s straight forward practical style continued inside with a modern dash array that still looks good today. Neither Volkswagen nor Audi had built anything so sleek and practical before. The long hood with sloping fastback design captured the public’s imagination (like the Datsun Z car then and the Audi A7 today). The Audi 100 Coupe S was never available in the US oddly enough, but we did get a rather upright two door sedan called the Audi 100. That car established Audi in America as a maker of stately yet economical sedans in 1970. It would be years later before the sporty cars made it the The States. Hit or no hit, Audi played it safe as the design ran until 1976 with only minor exterior changes. As a car powered with a small inline four cylinder engine, the 100 Coupe S was never designed to be a drag racer, but it could reach 60 mph from a stop in a bit over 10 seconds. That was considerably fast for the time, especially for a sub 3,000 lb. car with a 115 hp four cylinder engine. 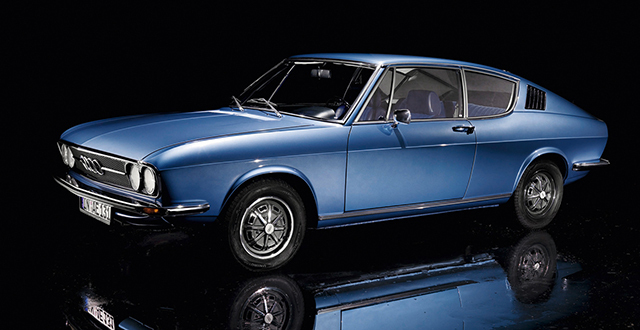 Unfortunately, like many cars of this era, the Audi 100 Coupe S had a rust problem. Despite the great numbers sold between 1970 and 1976, very few survive today. If you really want one, there are diecast versions available from Ebay and your local hobby shop. The few remaining real cars are sought after collectibles with a growing fan base. It’s handsome design is classic European GT car while it’s front engine water cooled engineering gave VW the experience they needed to move beyond Beatles when it’s sales started to decline during the late ’70s. The current trend of sleek Audi’s like the sloping C pillar of the A5 and A7 may have started with the 100 Coupe S. Of course today racy coupe profiles are everywhere in the Audi line. The 100 Coupe S may have been when the Audi brand reached out to become more like Auto Union and less like Volkswagen for the first time. This entry was posted on July 26, 2015 by autopolis in Audi and tagged 4 cylinder, 70's, german, rear wheel drive.